Di Fara’s is one of New York’s oldest and Original Thin Crust Kings. Others in my Pizza Panthenon are Totonno’s, Grimaldi’s, Ray’s on Carmine (now only on a good day), Patsy’s & Lombardi’s. Prolly some great places up in the Bronx and in Staten Island. Until I find anything better my absolute favorite is Totonno’s in C.I..
Not only MY favorite but apparently as witnessed by the weekly craft services table setups – that of the film industry as well. Great Light. After the pendulum swings, Obamania deflates and Americans see how difficult and liberating life Change was, would they then feel free enough to switch parties? 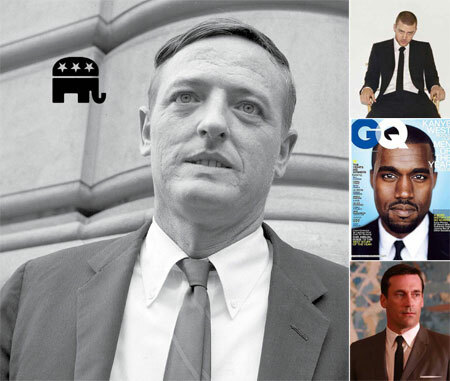 Here’s a strong case study for a Republican Party Re-Branding. The SoMa neighborhood was gentrified out of Filipino hands. I dug this audio interview from my media archive (a shoebox of cassette tapes). It features a very candid interview I did with Shep in 1999 for my Masters Thesis. 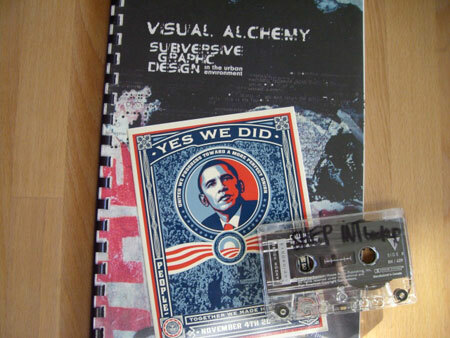 The Thesis focused on designers that use traditional advertising techniques to push social, subversive and/or anti-consumerist messages. This interview features an earnest sounding, pre-talking point Shep, before he went superdupernova. Here’s a segment, the full transcribed interview can be found in the Thesis pdf here. Wikipedia: Noble rot (French: pourriture noble; German: EdelfÃ¤ule) is the benevolent form of a grey fungus, Botrytis cinerea, affecting wine grapes. The Berkeley wine tasting group by the same name invited me to a session tasting 1985 California Cabernet Sauvignon. I felt pressured to take notes and kept score with eloquent, yet cryptic descriptions of the tastes: rosemary, ox blood, prune, eucalyptus because the bottle prices ranged from $120 – $450. Whenever I watch a film shot in NYC it’s always exciting to identify the street, neighborhood, train station or project building that was used in the location. Being born & raised in NYC I think I’m pretty damn good at it and sometimes the continuity doesn’t add up for example, a character can come out of the Union Square subway station and walk across the street to their apartment in Queens. Or better yet, when films ALWAYS use that shut down part of Hoytâ€“Schermerhorn station on the IND line but the character is supposed to be in Manhattan on an IRT line – C’mon Dog! My most recent spotting were the same DUMBO streets and camera angles used for American Gangster (2008) that were first used in The French Connection (1971). Last Summer they shut down my street and at 3AM towed all the parked cars on Franklin Avenue to film a scene from Notorious. I can’t wait to check this movie not only for the big screen biography of Biggie, but also because I get to see the US film industry’s oldest co-star – NYC. 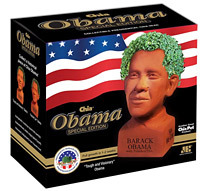 Have the Obama Commemorative Coin (there have never been living people minted on circulated US currency), Commemorative Plates, MLK, JFK, RFK, BHO T-Shirts, Obama x Spiderman Comic and Obama Chia Pet gone too far? Not far enough! 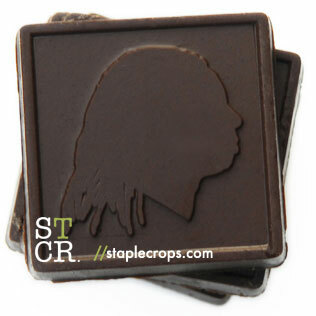 Obama 2oz Chocolate Bars to commemorate his historic Hip-Hop Word Count entry now available for pre-order in the STCR Store. 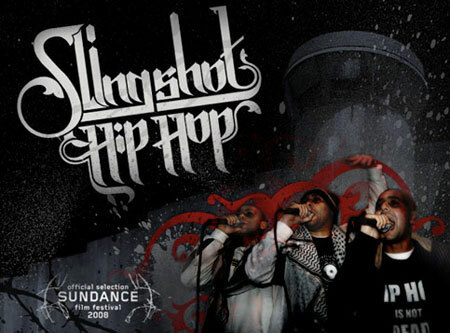 I saw Slingshot Hip-Hop last week in the South Bronx (SoBro – for the gentrifiers). I had to stop inside the Yemeni Bodega to get directions – it was down the block & around the corner from Me and Yemeni dude’s agreed upon landmark – White Castles. Brick outside, but the folks’ smiles inside to the Rebel Diaz loft were warm. Slingshot Hip-Hop covers the stories of young Palestinians living in Israel, Gaza, and the West Bank as they discover Hip Hop and employ it as a tool to surmount divisions imposed by occupation and poverty. I kicked it with the director and friends afterward and they told stories of her Jewish homegirl smuggling film out of Gaza in her knapsack.